Data Refuge (powered by CKAN) helps to build refuge for federal data and supports climate and environmental research and advocacy. Data Refuge is committed to fact-based arguments, and preserves the facts we need at a time of ongoing climate change. Data Refuge was launched November 2016 in Philadelphia to draw attention to how climate denial endangers federal environmental data. 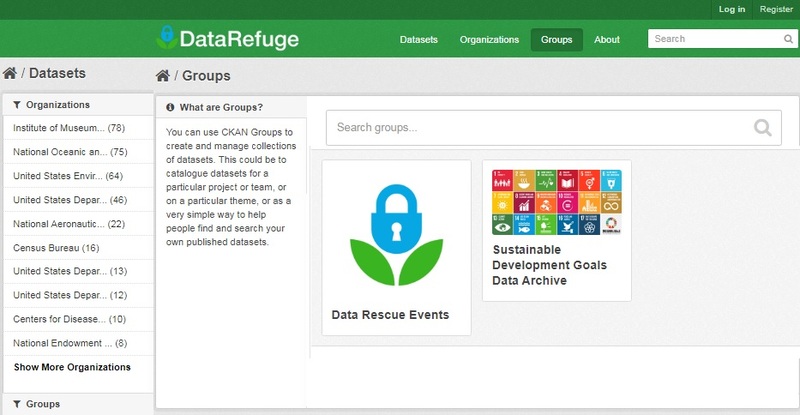 DataRefuge depends on local communities working in partnership with Environmental Data Governance Initiative (EDGI), Climate Mirror, ProjectARCC, and with local collaborators at #ProtectClimateData and other DataRescue events. What are the best ways to safeguard data? How do federal agencies play crucial roles in data collection, management, and distribution? How do government priorities impact data’s accessibility? Which projects and research fields depend on federal data? Which datasets are of value to research and local communities, and why? DataRefuge is also an initiative committed to identifying, assessing, prioritizing, securing, and distributing reliable copies of federal climate and environmental data so that it remains available to researchers. Data collected as part of the #DataRefuge initiative will be stored in multiple, trusted locations to help ensure continued accessibility. Now, Data Refuge is building a storybank to document how data lives in the world – and how it connects people, places, and non-human species. Learn more about Data Refuge and find out more about Data Stories from Data Refuge. Many More - How about you?